At Upgraded Points, we get a lot of questions about which are the “best” first class airlines. While there’s no objective answer that will please all travelers, we believe it’s worthwhile to create a list of our favorites. This list of the best international first class airlines will serve as a guide for you to start dreaming about your next first class flight purchase with points and miles. Keep in mind that we listed first class products that we personally think are the best based on our own experiences, industry research, and opinions of fellow travelers. What Makes an International First Class Airline Great? 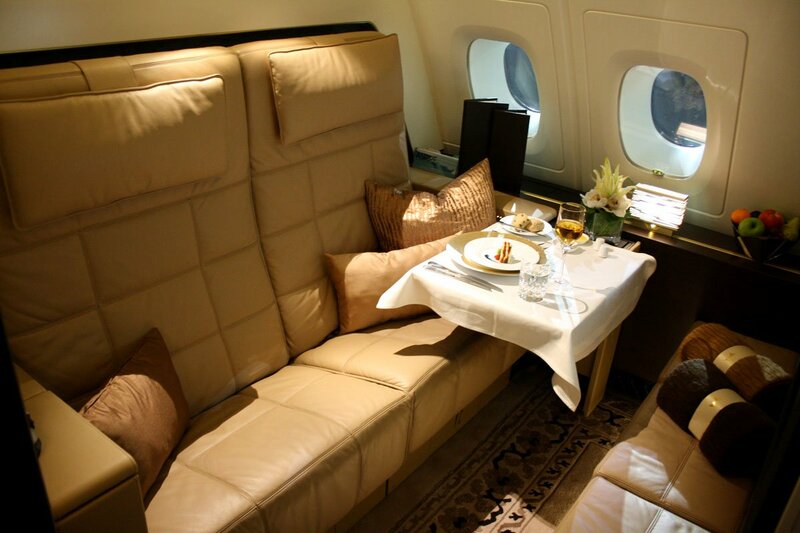 There are many different aspects that make first class flights special. For many of these airlines, the first class experience starts on the ground before you even get to the airport! Some airlines provide first class passengers with chauffeur service to the airport and access to magnificent first class lounges. That being said, this guide is not limited only to first class flights that are bookable with points. As you will find out, we include flights like the SWISS Air first class, which cannot ordinarily be booked with points. Hot Tip: Want to access more than 1,200 airport lounges across 130 countries (without flying Business or First Class?) The Platinum Card® from American Express is the #1 card for lounge access. Without further ado, let’s get into our list of the best international first class airlines and cabins. Remember that while we attempted to make this ranking as objective as possible, this list is still our opinion. We’ll provide an overview of the flagship product mentioned in each ranking, explain the best ways (if applicable) to book with points, and describe why we believe it deserves its ranking. The double bedroom aboard the Etihad Residence, one of 3 private rooms you get for booking. Image courtesy of CNN.com. The Etihad Residence is without a doubt the most phenomenal commercial flight experience you can have. 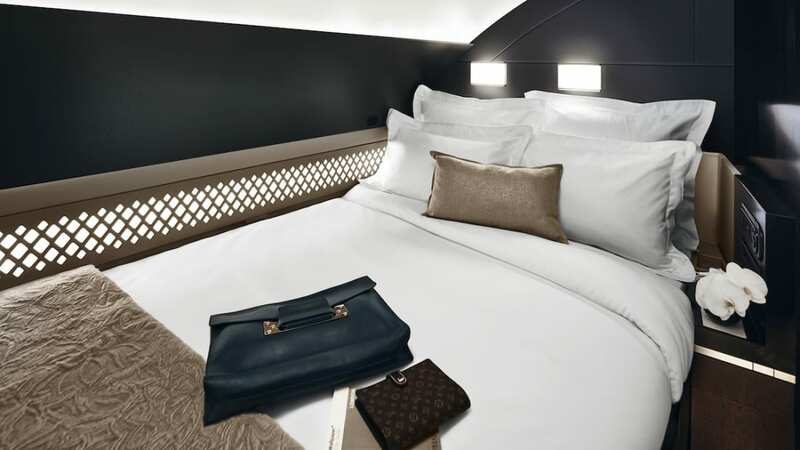 When you reserve the Etihad Residence, you get 3 separate rooms aboard the A380: a living room, bedroom, and shower room. Your double bed is 6′ 10″ long, your living room (actual seat) has a leather double seat sofa plus a 32″ inflight monitor, and your bathroom is your own private oasis with a full-height shower and vanity. Can you imagine having your bathroom plus shower to yourself on a plane? Flying on the Etihad Residence will afford you this and so much more. Image courtesy of etihad.com. You’ll also have a private butler and inflight chef. To call this pampering is a complete understatement. This is your Etihad Residence seat…aka the Etihad Residence Living Room. Image courtesy of ausbt.com. You’ll be able to request customized food ahead of time, utilize a luxurious chauffeur, and pretty much request anything (legal) you want! This product is absolutely nuts. Unfortunately, you can only find it on the A380, of which Etihad flies 1 to the U.S. on the New York City (JFK) – Abu Dhabi (AUH) route. Contrary to popular belief, you can actually fly on the Etihad Residence with points — you’d just need around 1-3 million Etihad Guest miles each way. Psst…award availability is very good! I guess it has something to do with the fact that 1-3 million miles present a high barrier to entry, so most people don’t have enough points to be able to afford this luxurious experience. Etihad Residence awards from Abu Dhabi to New York price out pretty high! Image courtesy of etihad.com. Indulge in French elegance and perfection with Air France La Première on the 777-300ER. Image courtesy of businesstraveler.com. 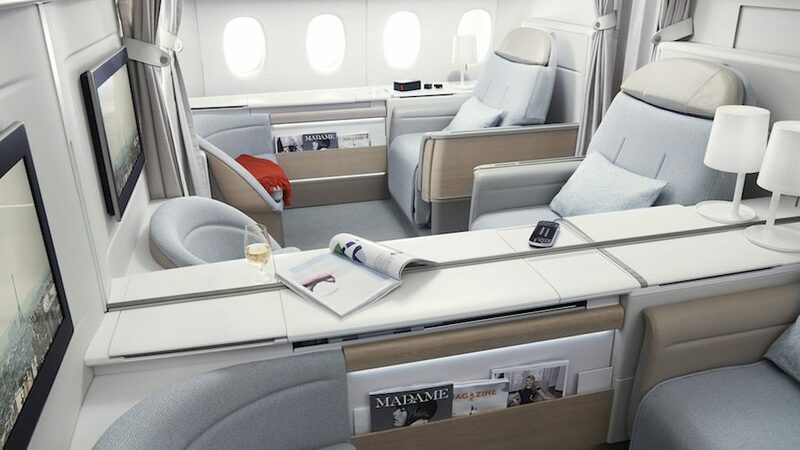 Air France calls its long-haul first class “La Première.” It’s operated on the A380 and 777-300ER, but you should never fly on Air France in the A380, as its premium cabin products are not near as nice. On the other hand, Air France’s 777-300ER business and first class products are quite sensational. La Première includes one of the best ground experiences, including tarmac transfers in luxury cars and access to a beautiful lounge in Paris. It’s also one of the only flights that separates seats with curtains, and your area comes with a desk lamp for reading after the lights are dimmed. You’ll enjoy exquisite and phenomenal French dining along with ridiculous exclusivity and privacy. To even book La Première, you have to hold elite status with Air France/KLM Flying Blue. Keep in mind that holding the lowest-tier, Flying Blue Silver, will also enable passengers to book La Première (albeit at an exorbitant price). 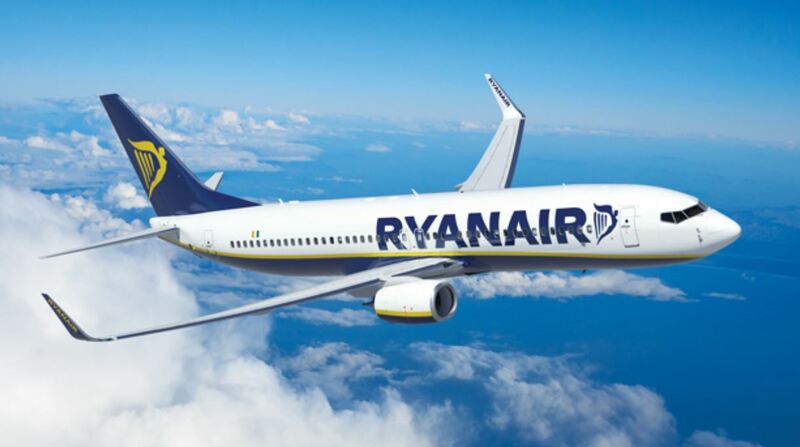 If you’ve got your heart dead-set on booking La Première with points and also have secured Flying Blue Silver, at minimum you can expect to pay 200,000 Flying Blue miles one-way on flights between the U.S. and Europe. There are also some very intriguing routes that operate La Première on the 777-300ER, such as to/from São Paulo (GRU) and Luanda (LAD). All in all, it’s extremely difficult to book La Première with points, but there are periodically promotional prices that discount this product to a more manageable price. Though only offered on limited routes, the Emirates 777 First Class Suites are brand-new and feature fully-enclosed rooms. Image courtesy of theverge.com. Emirates Airlines is known for having more glitzy and over-the-top first class products. With stiff competition from Singapore Airlines and Etihad, they’ve been tasked with continuously innovating more luxurious experiences. They have therefore rolled out the new 777-300ER First Class Suites. With 6 suites per aircraft in 2 rows configured in a 1-1-1 arrangement, these suites have caught the frequent flyer world by storm. These First Class Suites are the first seats that feature a fully-enclosed seat with floor-to-ceiling walls, which means 1 thing: total privacy. 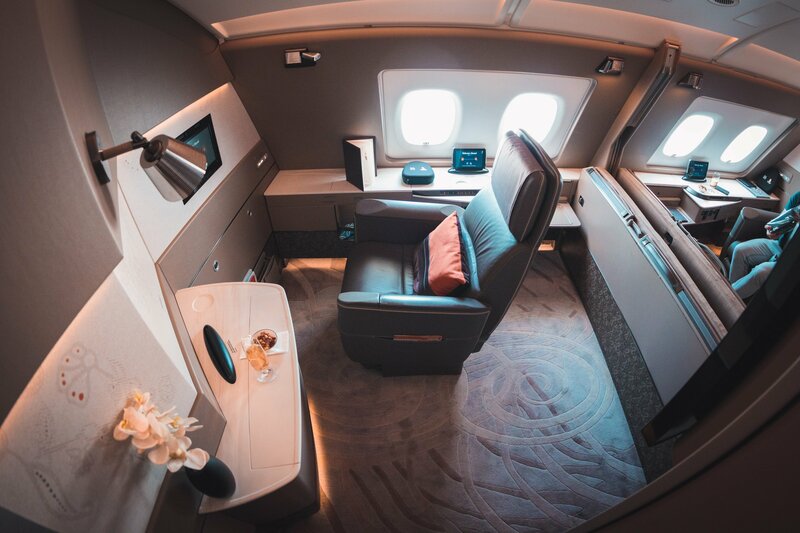 On top of this, you’ll enjoy classic Emirates luxury including Bulgari amenities, Emirati fine-dining, virtual windows (on middle seats), personal climate controls, on-demand dining via your personal tablet, and beautiful cabin finishes thanks to Mercedes-Benz. Unfortunately, there are no planes with the new first class suites on flights to or from the U.S. — the 777s flying to the U.S. don’t have these products yet. Emirates new First Class Suites seat map. Image courtesy of expertflyer.com. The best way to book these suites is to find a cheap flight, typically through a routing like Colombo (CMB) – Geneva (GVA). 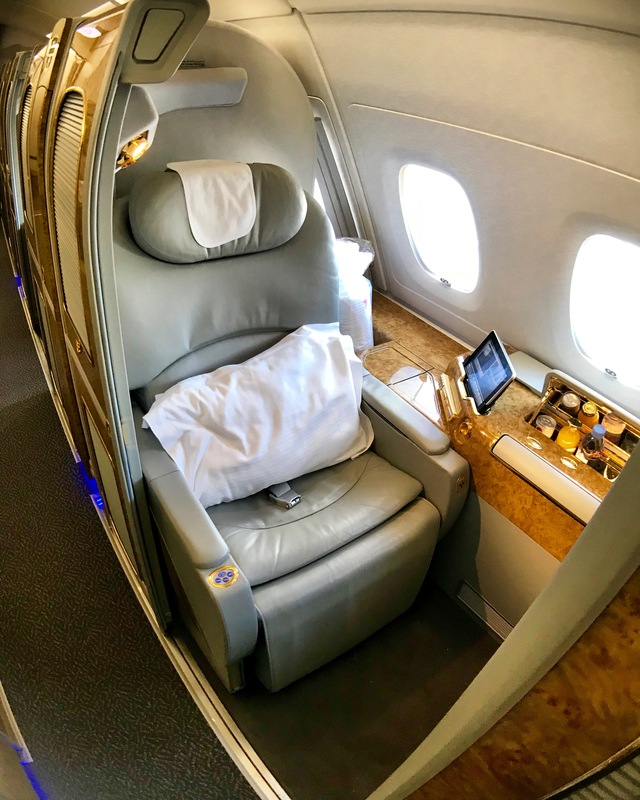 Check out this itinerary, which is ridiculously cheap at $3,400 round-trip for 22 hours in Emirates’ new First Class Suites. Originating in a city like Colombo can make Emirates cash fares cheap! Image courtesy of google.com/flights. Hot Tip: Need help booking? See our guide on the best ways to book Emirates First Class using points. Flying on Singapore Airlines is something that the Upgraded Points team is very familiar with — we’ve flown both the new and old A380 suites. Needless to say, we love flying on Singapore Airlines. Though the ground experience isn’t as refined as Air France’s La Première, you do get access to The Private Room at Changi Airport (SIN), which features a-la-carte dining. Singapore’s new A380 First Class Suites features your own private seat, along with a separate bed that which you can turn into a double bed with 2 seats. You can utilize a personal tablet to control lighting, request service, and more. Arranged in 3 rows of 2 seats for 6 suites total, these A380 First Class Suites are very exclusive. 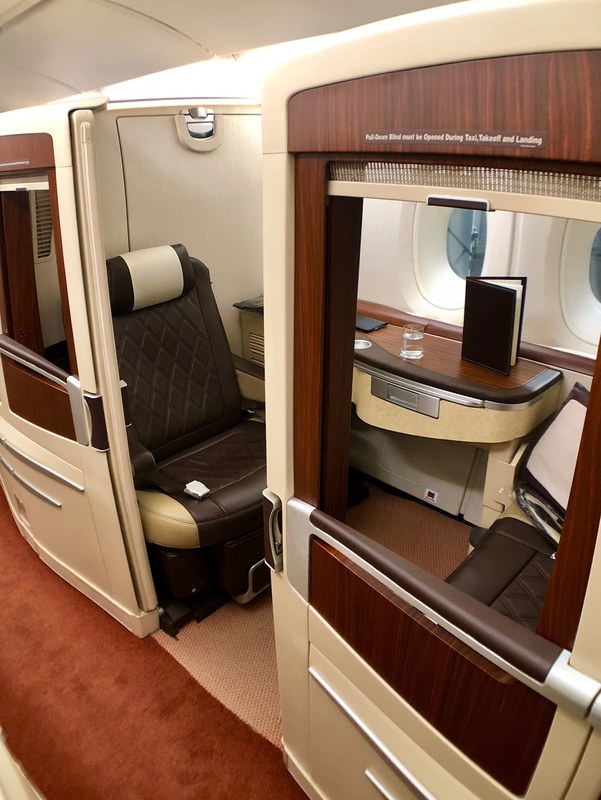 You can swivel and recline your chair and slide a door closed to make your suite super private (though not fully enclosed with floor-to-ceiling doors like Emirates’ 777 new First Class Suites). The luxurious Lalique amenities along with the 32″ television monitors make this a must-experience for everyone. Don’t forget to sip on unlimited Dom Perignon champagne! Singapore Airlines is pretty consistent about releasing award seats, but unfortunately the new A380 is only flown to select destinations from Singapore. Bottom Line: Singapore Airlines’ ultra-luxe new A380 First Class Suites are a great way to fly on flagship routes to Hong Kong (HKG). Unfortunately, partner award availability is nonexistent, so you’ll need to use their own mileage system. Luckily, they are transfer partners with American Express Membership Rewards, Chase Ultimate Rewards, Citi ThankYou Rewards, and Marriott Bonvoy. Image courtesy of Greg Stone. Rightfully, Lufthansa is an airline that turns heads with its first class. Though its business class (which doesn’t feature direct-aisle access for all seats) leaves much to be desired, the first class is certainly top-notch. Lufthansa’s hard product isn’t anything terribly special; it’s the soft product that makes all the difference here. You can expect some fantastic food, a polished First Class Lounge featuring a cigar bar, and an unforgettable ground experience featuring Porsche tarmac transfers. Award availability isn’t released to partners until around 15 days before departure date. Hot Tip: Need help booking? See our guide on the best ways to book Lufthansa First Class using points. Flying on Cathay Pacific First Class is sublime. 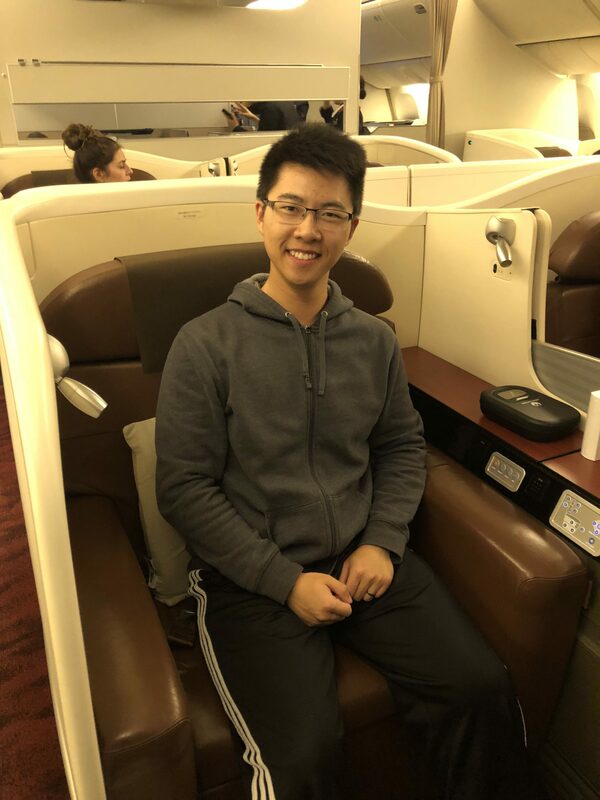 Cathay Pacific is an airline that holds a special place in my heart as a Hong Konger, and the luxury afforded by Cathay Pacific in first class is fantastic. They’ve got industry-leading seat width at 36” wide, and a 2-row cabin on the 777 with a 1-1-1 configuration. These seats are massive and can fit up to 3 people comfortably. 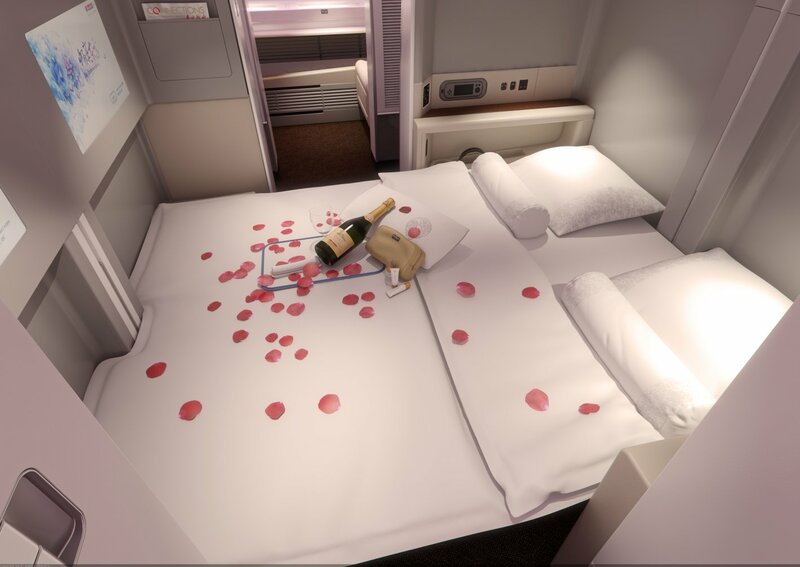 You’ll enjoy one of the most comfortable lie-flat beds in the sky, plus caviar, champagne, and a level of service that’s far too rare nowadays. You can book this with American Airlines miles, Alaska miles, Cathay Pacific Asia Miles, and British Airways Avios. And if you’re interested in routes to/from the U.S., don’t miss our Definitive Guide to Cathay Pacific U.S. Routes. Hot Tip:Also, make sure to check out our guide on the best ways to book Cathay Pacific first class. The Japan Airlines first class seats feature an amazing 33″ width. Image courtesy of Stephen Au. Japan Airlines is an airline that I will never be opposed to flying. 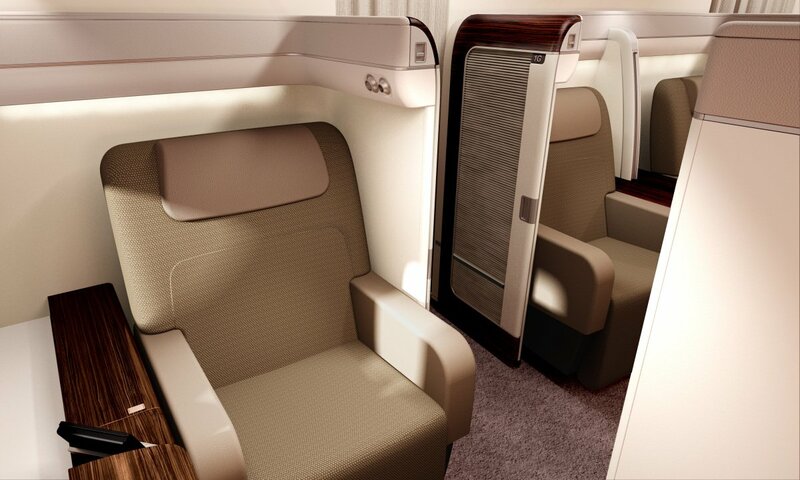 They’ve got a retro look on their first class product, ranging from the lounges to the brown leather armchair. Their food and beverage are top-notch, featuring the discontinued (and very expensive) Hibiki 17 whisky. All first class passengers on long-haul flights receive Bose noise-cancellation headphones, multi-course (almost like kaiseki) meals, Shiseido wellness kits in addition to amenity kits, Cristal champagne (on U.S. routes), and super comfy pajamas. Japan Airlines is excellent about releasing close-in award availability — they release pretty much all of their unoccupied seats a day or 2 before departure. They’re also excellent about releasing consistent award seats farther in advance. Some of the best ways you can book Japan Airlines first class are with American Airlines miles, Japan Airlines miles, and Alaska miles. Hot Tip: Not sure which rewards card is best for you? Read our expert opinions on the 10 best travel rewards cards in our deep-dive post! ANA’s First Class Suites is a strong competitor to Japan Airlines first class. Image courtesy of Spencer Howard. ANA’s first class is similarly exquisite — almost like a pod with an inordinate amount of privacy. You’ll enjoy a great variety of food and beverage when flying ANA’s first class; the seat itself has tons of storage and features some great engineering. The sacrifice in having all this storage and handy compartments is that window seats only have 1 window, as opposed to the 2 or 3 windows in other airlines’ first class seats. One drawback in this seating configuration is that the seats are actually a little too private — to the point that if you’re traveling with someone else, talking to them might be difficult. On the plus side, they offer Samsonite amenity kits, which is a nice collectible item. ANA releases plenty of award availability far in advance, since their general philosophy is not to release award seats right before departure — they’d rather fly the seats empty. As a result, your best bet is to book far in advance. 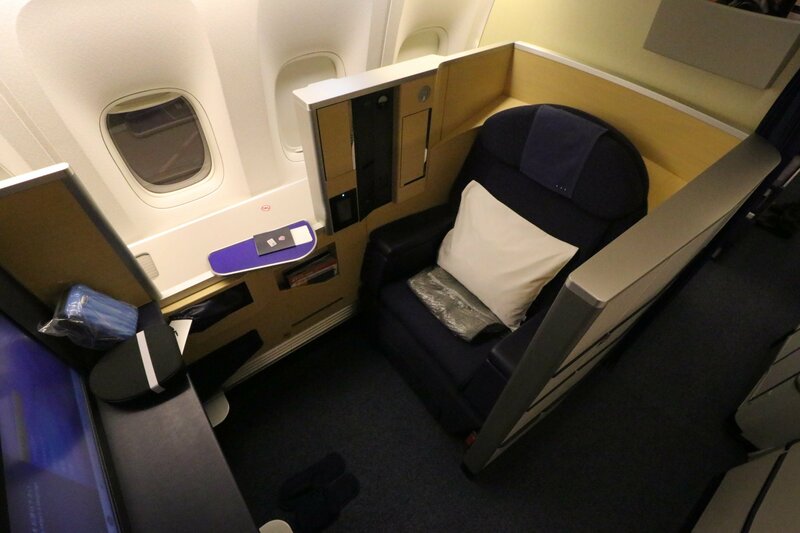 There are many ways to book ANA first class, and each has benefits and drawbacks. Booking with ANA gives the best award availability and great award rates. Unfortunately, you can only book round-trip tickets. 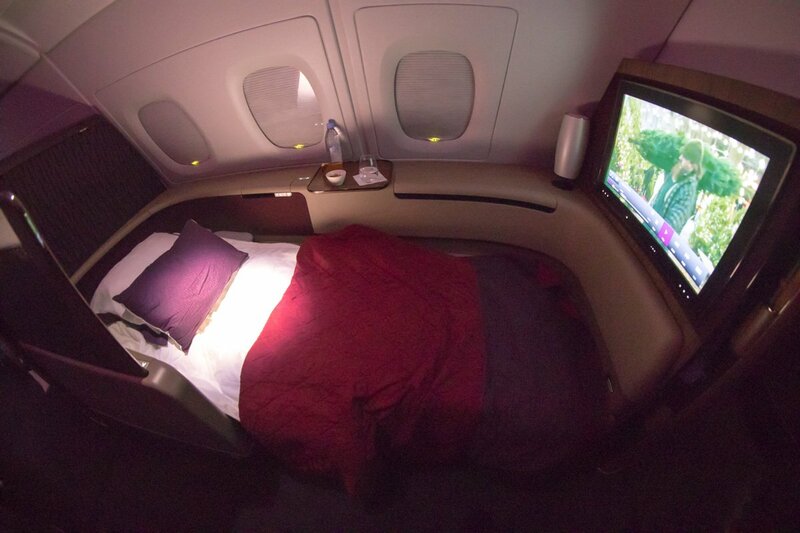 Virgin Atlantic gives the best first class award prices, by far. You can also book with Air Canada Aeroplan, United MileagePlus, or Singapore Airlines KrisFlyer. The Emirates A380 First Class Suites are an absolute classic. Embrace the luxury aboard this flight! 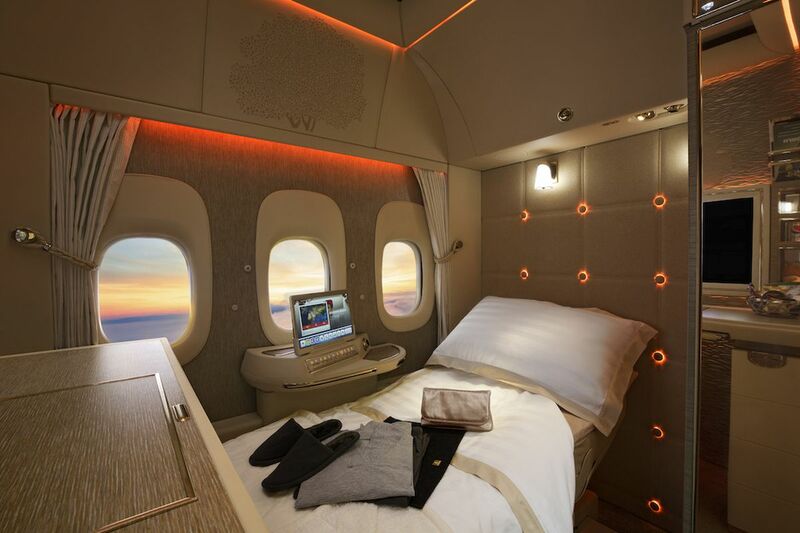 The Emirates A380 First Class Suites have captivated the frequent flyer world for many years. When it first came out, it was a game changer for first class flights — especially with the inflight shower spa. These suites are equipped with gold and wooden finishes, Bulgari amenities, your own private mini-bar, and more. Emirates offers bottomless caviar and Dom Perignon champagne, a very long seat, the famous inflight shower spa, and fantastic onboard entertainment. The only drawback to these First Class Suites is that the seats are actually not that wide at 23”. Also, the food can be hit-or-miss. Overall, though, this is a very blingy product that will certainly make for special memories. Emirates also historically offered a chauffeur service, though that’s no longer the case, even for award bookings made with Emirates miles. Generally, Emirates is very good about award availability, especially far in advance. Close-in award availability is less consistent, but still possible. The main catch is that you’ll either pay huge in miles or huge in surcharges ($1,700+!). The best way to book Emirates first class without paying huge surcharges is with Alaska miles, which is still ridiculously expensive. Some other ways to book with surcharges include Emirates Skywards, Japan Airlines miles, and Korean Air. Hot Tip: Consider also going to a destination that prohibits fuel surcharges, such as Australia or New Zealand. The Apartments on Etihad’s A380 are second to none. Image courtesy of Upgraded Points. The Etihad First Class Apartments are a classic version of Middle Eastern luxury. Though the airline is struggling to make ends meet, it’s still possible to fly this product…for now. These Apartments are pretty similar to Singapore Airlines’ new A380 suites (see #4 above), except that your Apartments seat doesn’t swivel like the one in the Singapore product. In the Etihad First Class Apartments, you’ll find a separate armchair and 6’10” bed. There are beds that connect with each other so you can make it a sort of double bed — though there will still be a wall halfway through that separates the 2 people. 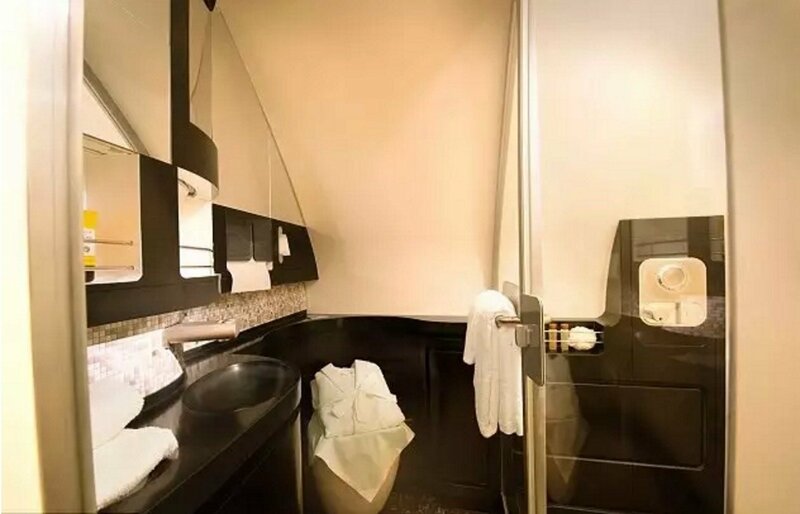 You can also enjoy the shower and bar aboard the flight, as well as inflight chefs, a meeting room/lounge, and en-suite vanity. Acqua di Parma is typical for the Apartments amenity kit (a legitimately fantastic skincare line). Etihad is very reliable when it comes to award availability for up to 2 passengers in the First Class Apartments. Unfortunately, the only route you can find it on in the U.S. is from New York City (JFK) to Abu Dhabi (AUH), just like on the Etihad Residence (see #1 above). 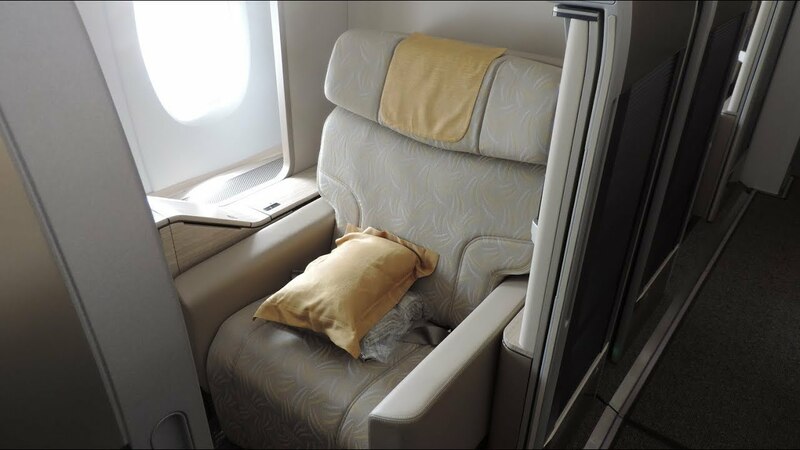 Though there are many ways to book Etihad First Class with points — you can use American Airlines miles, Etihad miles, and Asiana miles for some great deals. If you’re flying internationally, try out the Apartments on a non-U.S. flight to get access to more award availability. THAI Airways operates the A380, which features Royal First Class. Image courtesy of travel.bart.la. Here’s the thing about Asian carriers: the hard products on first class may not be as cutting-edge or “blingy” as on the Middle East carriers, but the soft product and service are almost unbeatable. This is the case for a carrier like THAI Airways, which operates a bunch of planes that have a first class product: 747s, 777s, A380s, etc. The hard product in first class is pretty similar, though the A380 seats are actually a bit larger (definitely not the case for business class). The 747 has more private seats, but they’re a tad smaller. It all depends on your personal preferences. THAI Airways is also one of the few airlines that provide Rimowa amenity kits, which I go nuts for (it’s a strange obsession, I know). The best way to summarize THAI Airways first class is that you’ll be treated like royalty. Say hello to buggy transport in the airport, complimentary 60-minute massages, free flow of Dom Perignon, and great inflight amenities (like those Rimowa kits!). The only problem is that their inflight Wi-Fi isn’t free — and it’s not cheap either. THAI Airways doesn’t operate any flights from the U.S.; we would highly suggest departing from Bangkok (BKK) to experience the First Class Lounge (and massage). You can use Avianca LifeMiles or United miles to book THAI Airways first class. There’s some phenomenal value to be had here, particularly between Bangkok and Australia/New Zealand or Tokyo. Garuda 777 first class is stunning, not only for its hard product (private suites with doors), but also because of the service and warmth. Image courtesy of thedesignair.net. Garuda Indonesia is the flag carrier of Indonesia, and they equip a select number of 777-300ER’s with their flagship first class product. It is notoriously difficult to book this Garuda first class product. Actually, it’s difficult to book SkyTeam first class flights in general, so Garuda isn’t alone here. Still, it’s especially difficult even compared to other SkyTeam Airlines. 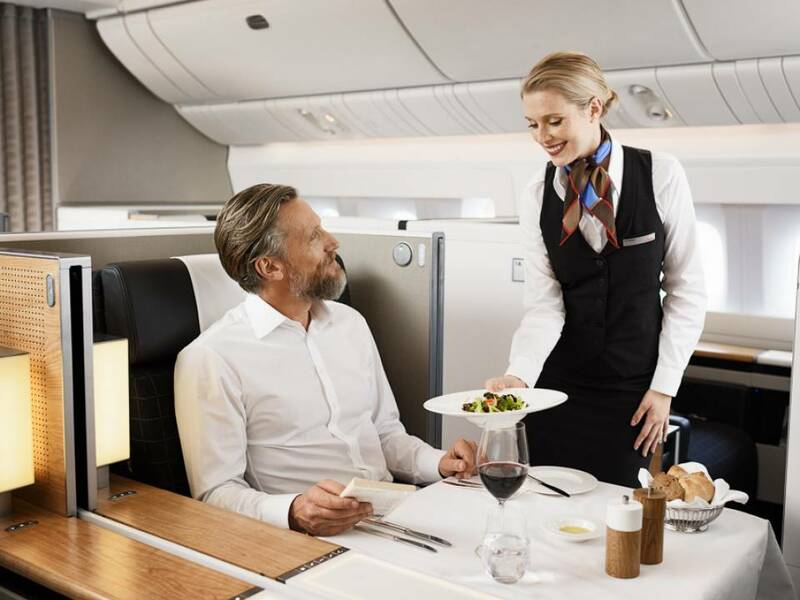 If you do manage to snag a first class flight, you can expect chauffeur service, perfect customer service at every point of your trip, a fantastic hard product, and an onboard feast. Interestingly, Garuda Indonesia is a transfer partner with Citi ThankYou Rewards, and they have in the past offered 90% off first class award bookings, which is frankly ridiculous. Be warned, though — the normal one-way first class award prices are off-the-wall expensive. Like, 190,000 miles one-way from Jakarta to London expensive. Singapore Airlines has 2 variants of their First Class Suites. We talked above about the new First Class Suites on the A380 (see #4 above), but the “old” First Class Suites on the remaining A380 routes are still phenomenal. There are 4 rows of suites, with rows 2 and 3 in a 1-2-1 configuration and rows 1 and 4 in a 1-1 configuration on the sides of the aircraft. The middle seats are the ones that can be converted into a double bed, so consider that when choosing your seat(s). It’s honestly difficult to complain because Singapore Airlines executes the big things extremely well. You may experience poor Wi-Fi connectivity or a slightly “dated” product, but seriously? These are insignificant in the grand scheme of things. The Singapore Suites amenities are typically Lalique, the inflight monitor measures at 23”, both Krug and Dom champagne are offered, and a glorious pre-booked service called Book The Cook is customary (hello, lobster thermidor!). All in all, this product is excellent. But the saver availability on the New York City (JFK) – Frankfurt (FRA) route is pretty sparse. You can generally find 1 seat far in advance, though finding 2 seats in advance is pretty challenging. If you’re willing, you can fly from Singapore and experience Singapore Suites as well as try the Private Room, which is a super exclusive lounge. Want the scoop on flying Singapore Airlines U.S. based routes? Check out our guide on every Singapore Airlines route to/from the U.S. (including plane types). 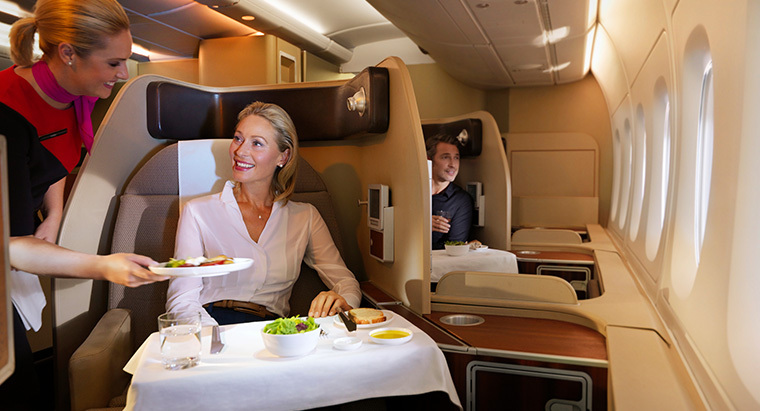 Enjoy a nice meal (or 2) on your journey to Australia in Qantas first class. Image courtesy of Qantas. Qantas is one of the hottest airlines, and for good reason. Between their impeccable safety record and dominant position as a leading airline, there’s no secret that flying to Australia and flying on Qantas go hand in hand. The best way to get there? Qantas first class, of course. Qantas has SK-II amenities, a swiveling first class seat in a private 1-1-1 configuration, Martin Grant pajamas, and one of the most comfortable beds in the sky. This can’t be emphasized enough: if there’s one flight you can bet you’ll definitely sleep on, it’s most likely Qantas first class. On top of the long flight times, this makes for a cozy experience in your seat. Unfortunately, it’s becoming exceedingly difficult to find award availability on Qantas first class from the U.S., especially for more than 1 passenger. Hot Tip: You can utilize Alaska miles, American Airlines miles, Japan Airlines miles, and Asia Miles as the best ways to book Qantas first class. Revel in Swiss luxury aboard SWISS International Airlines first class. Image courtesy of swiss.com. 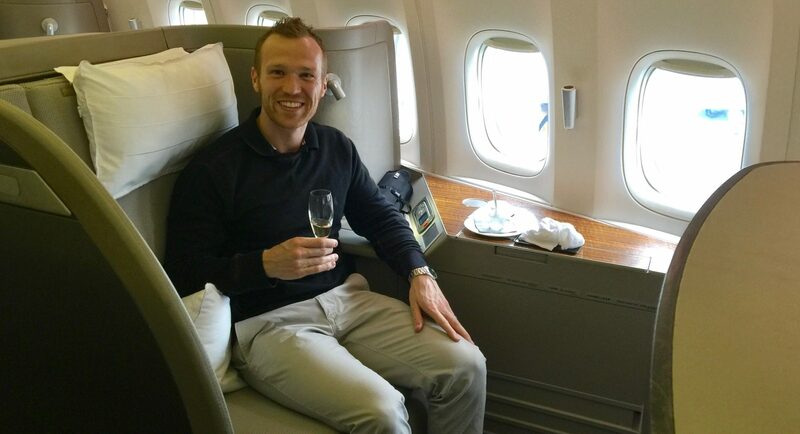 Lufthansa deserves a ton of credit for being the dominant player in first class to Europe. However, not far behind is SWISS International Airlines, which is also owned by Lufthansa Group, the parent company of Lufthansa Airlines. We discussed earlier that Lufthansa’s partner award inventory is released only a maximum of 15 days before departure, so it’s generally impossible to plan far ahead. Still, it’s very possible and probable to book Lufthansa first class if you’re flexible. But this isn’t the case with SWISS International Airlines. You can’t book SWISS first class unless you possess top-tier Senator or HON Circle elite status with their frequent flyer program, Miles & More. So for most of us, it’s completely out of reach. Still, it’s great to talk about one of the fanciest first class products out there. Once onboard, you’ll have a large and elegant armchair welcoming you as your new abode on your long-haul flight. Seats are arranged in 2 rows in a 1-2-1 configuration, featuring a 22” width (which increases when you use the lie-flat setting) and 80” of bed length. You’ll be afforded a generous amenity kit featuring La Prairie amenities, Zimmerli pajamas, a selection of caviar, and other excellent cuisine. SWISS International Airlines first class features sliding doors, which is an advantage over Lufthansa first class — you’ll get a ton more privacy in your first class flight. Singapore Airlines first class on the 777. Courtesy of singaporeair.com. 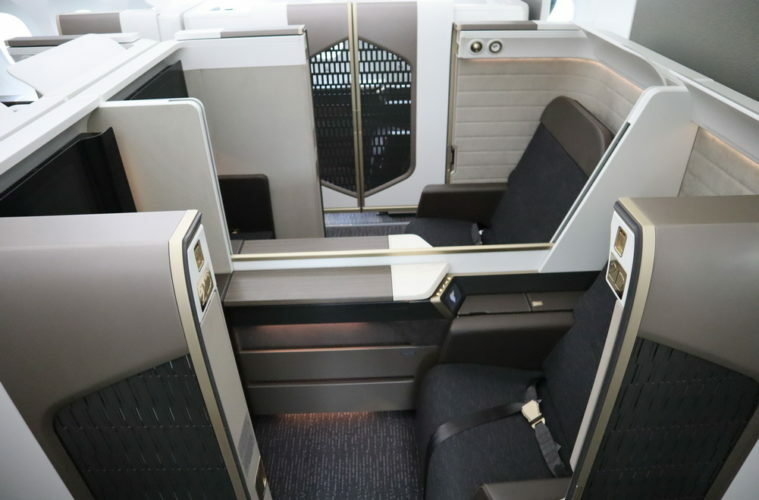 Both Singapore Airlines’ old and new A380 Suites are a huge crowd pleaser, but Singapore Airlines also operates the 777-300ER on a select few routes to and from America. It may not be as private as the first class suites on the A380, but the 777-300ER first class is extraordinarily luxurious in its own right. There’s only 1 row in a 1-2-1 configuration, making this cabin extremely private with a total of 4 seats. Seats measure out to a massive 35” wide and 81” long when turned into a bed. This width is just 1” short of Cathay Pacific, which holds the record for widest first class seats. 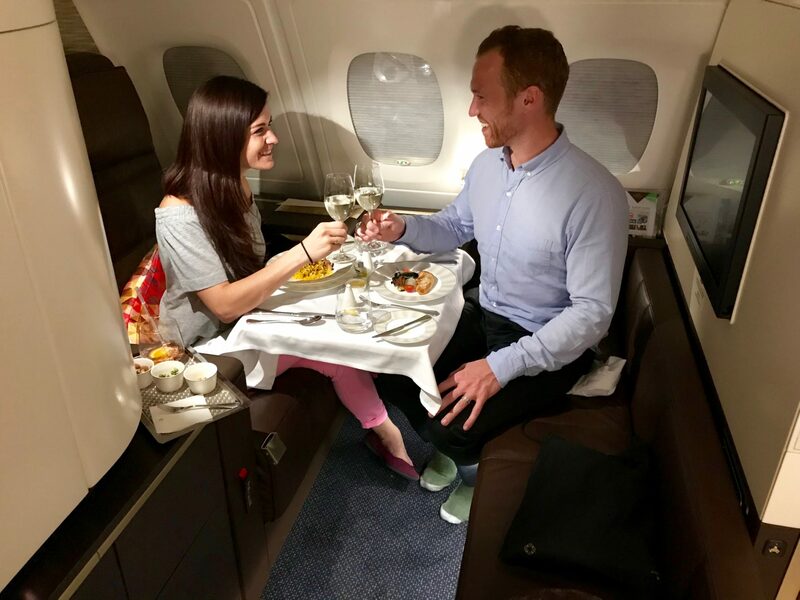 Expect Salvatore Ferragamo amenities, comfy pajamas, excellent inflight entertainment, Bose noise-canceling headphones, Dom Perignon champagne, and Singapore’s signature Book The Cook service. Award availability for this first class product is generally pretty good, since much of the attention is drawn to the A380 First Class Suites. Hot Tip: Need help booking? 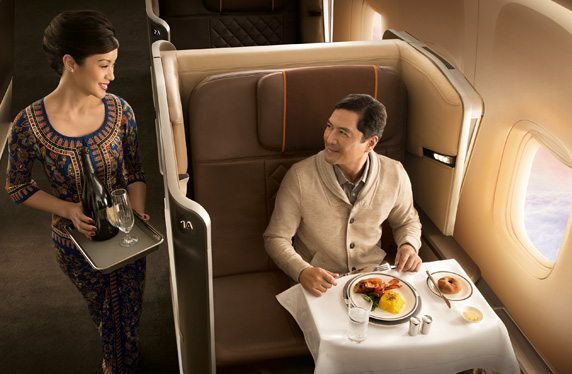 See our guide on the best ways to book Singapore Airlines First Class using points. Korean Air flies a whole slew of planes to America: the 747, 787, 777, and A380. They also have Kosmo Suites and Kosmo Suites 2.0 — these are fantastic, and in first class on all planes except the 787 Dreamliner. Kosmo Suites 2.0 have sliding doors that enclose each individual seat, unlike the regular Kosmo Suites on the A380. As a result, you really want to fly on Kosmo Suites 2.0 when you can (offered on the 747 and some 777s). Here’s the best way to describe Korean Air first class: completely satisfying in the air but somewhat disappointing on the ground. The lounge experience when flying Korean Air first class is generally poor, and special transport is nonexistent. Seriously — Korean Air’s first class would be a contender for one of the best first class products in the world if it would improve its ground experience. 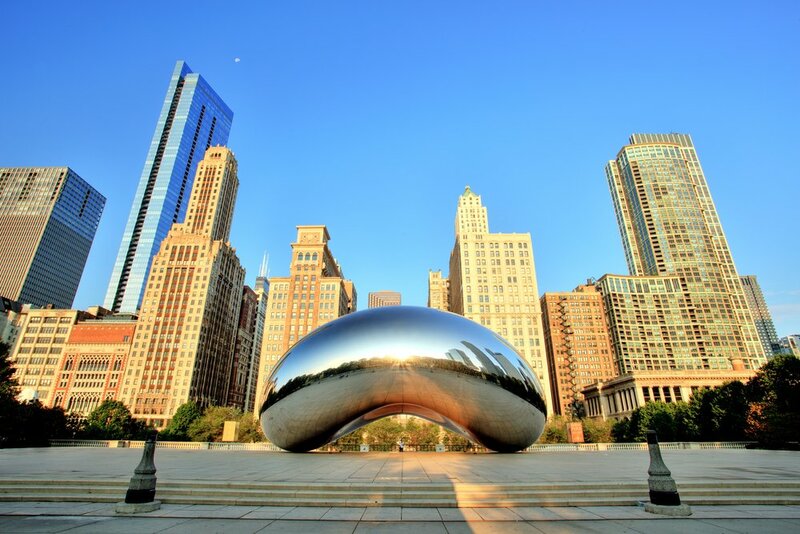 Fly them from places like Atlanta (ATL), San Francisco (SFO), Chicago (ORD), New York City (JFK), and Las Vegas (LAS). 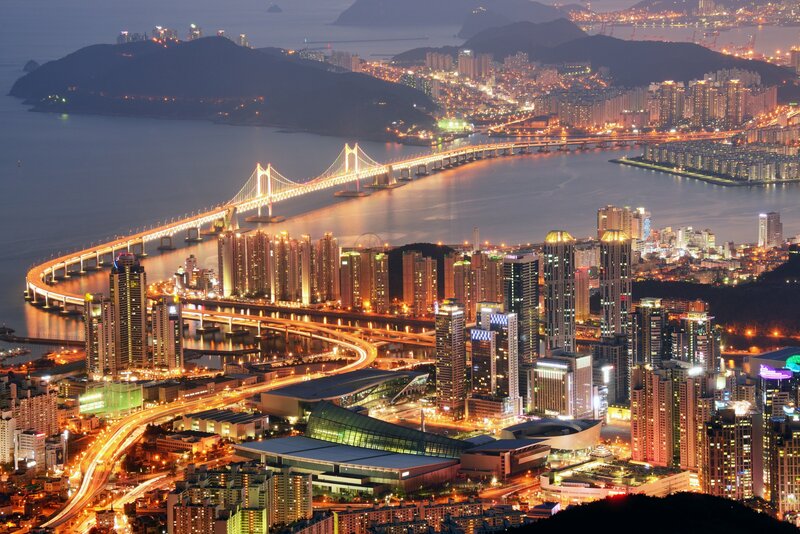 Hot Tip: You can book Korean Air first class primarily with Korean Air SKYPASS miles. Rates are generally reasonable if you don’t book during peak season. Asiana Airlines is one of the biggest competitors of Korean Air — they share a common hub airport and fly to a lot of the same destinations. So it’s actually best to compare Asiana first class with Korean Air first class. First, Asiana offers fewer routes, as it’s a smaller airline. They fly the A380 to just 2 cities: Los Angeles (LAX) and New York City (JFK). There are 3 rows of 4 seats each in a 1-2-1 configuration with sliding doors, allowing you to have a very private experience. The seats are very large, measuring 25.2” wide and 81” long in bed mode. 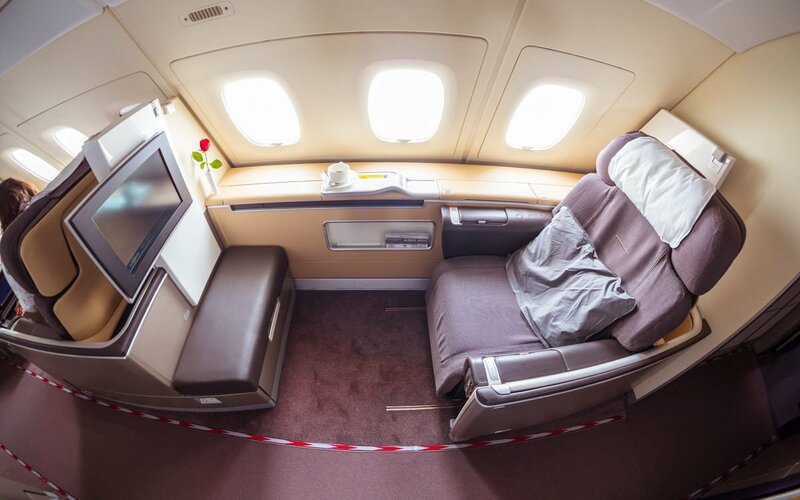 You’ll enjoy caviar, solid dining options, a large seat, lots of privacy, and unpolished luxury with Asiana Airlines’ A380 first class product. Asiana Airlines first class also offers a ridiculous amount of award availability, and it’s an unpretentious way to fly first class comfortably. The amenities aren’t as luxurious as Korean Air’s, but it’s dramatically easier to book. An 87″ length is no joke. Find this on Oman Air’s first class aboard the 787-900. Image courtesy of samchui.com. 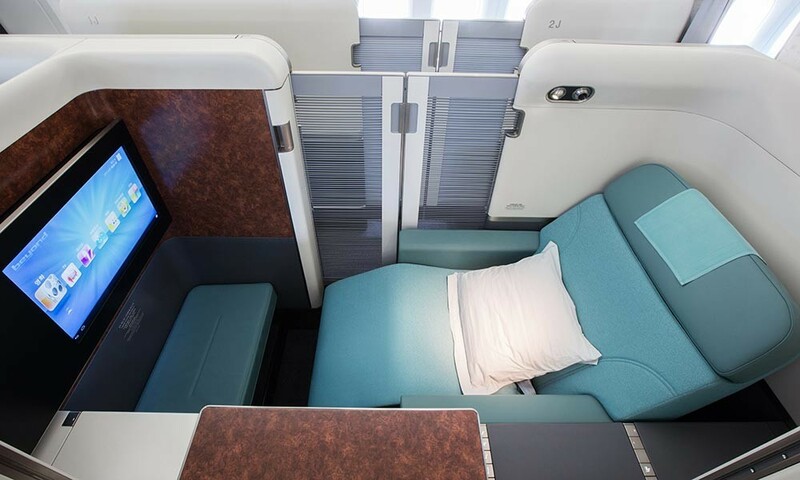 Oman Air, which is one of the undeservedly forgotten Middle Eastern carriers, recently revealed their new 787-900 Dreamliner, which features a first class suite that looks ultra chic. There are 2 rows with 8 seats total in a 1-2-1 configuration, each with a sliding door you can use for the utmost privacy. The food is amazing and the ground experience (in Muscat, Oman) is reputed to be stunning. Just like Japan Airlines, Oman Air serves Cristal and Grand Siecle, which is fantastic. Of course, caviar is a given in this first class. You get your own mini-bar beside your seat, but the main storage is in shared lockers, which is interesting. Cabin finishes are sensational, with marble even being used at the side table next to the seat. Some of the drawbacks include poor Wi-Fi (OnAir), lackluster bedding and headphones, and limited route options. Hot Tip: Check out our guide to using Etihad Guest miles, which is a partner with Oman Air, to book Oman Air first class. Qatar Airways’ A380 first class is absolutely fantastic. Although Qatar Airways is world-renowned for their new QSuites business class (which could actually qualify as a first class product), it’s their A380 first class that’s one of the most underrated flights out there. We did a review on the Sydney (SYD) to Doha (DOH) route, where you can read more details and get a better idea of what it’s like to fly this product. The A380 is a ridiculously fun plane to fly on – Qatar decorates their cabins super well, includes great amenities, and has a beautiful first class lounge in Doha. They also have a super fun bar onboard. Best of all, there’s tons and tons of award availability! China Eastern’s 777 first class offers fully lie-flat double beds along with doors. Image courtesy of pointsfromthepacific.boardingarea.com. The very last product is one that has significantly improved over the years, especially when it comes to the soft product. It’s one of the few airlines to feature double beds in first class. China Eastern’s hard product was already fantastic, with the double beds enclosed in suites that have sliding doors (which is the best of any Chinese airline). The seat itself is actually quite large at 26.5” wide and 79” long. There are 6 seats across 1 row in a 1-1 configuration on the sides, a bar in the center, and 1 row in a 1-2-1 configuration. Passengers receive Salvatore Ferragamo amenity kits…but the soft product pretty much maxes out there. The first class service seems to be very inconsistent, though it’s going to be the most comfortable way to fly first class to China. Overall, there’s a ton of variation among first class across the world’s major airlines. We’ve analyzed the major first class products and put together a list of the best first class products here. Remember that a different plane can have a completely different first class, even if it’s on the same airline. 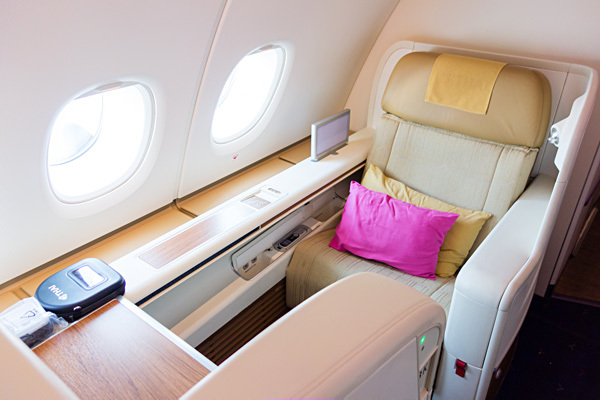 Now you know which of the most aspirational first class airlines to book your award travel on! Thanks for another great article! I enjoy reading your pieces especially ones that features any premium seats to Asia! With that said, I would like to know which of the above mentioned airlines have best availability from/to US (NYC) to Asia? We are a family of 3 (with a baby). I know generally speaking, it’s really difficult for 3 F’s, but I know it’s possible (eg JAL). Thanks! Also, would love to see similar blog on business class (if not already written)! Hey Ethan! As always, thanks for reading. If flying from NYC to Asia, you’ll want the best compromise between award availability and quality of first class product. You have tons of options flying out of JFK. It all depends too on what level of risk you’d be willing to take in terms of how close to departure you feel comfortable waiting. 1) When you said, “Personally, I always like booking something confirmed and then follow award availability closely. I use ExpertFlyer, KVS, and basically every tool imaginable to do that”–Do you mean you book the seats (F) first and look at these (eg. ExpertFlyer) to change seats or dates (any extra cost to change dates on same rountes)? 2) Is it possible or recommended to book 1 CX F when there’s availability and 2 J’s at same booking, then use ExpertFlyer to see if any other F’s open up and if so, switch 1 or 2 of the J’s to F’s? If so I would have to call AA to make the change (assuming I’ll be using AA miles) and pay the miles difference along with any fees (if any), right? Thanks again and really looking forward to the business class version! 1) Yes. For example, I booked SJC-NRT on NH J because that was the best-case award availability close to LAX at the time. I’ve set flight alerts for LAX-NRT on NH J/F because my home airport is LAX. I paid for a cheap LAX-SJC flight on Southwest just in case, but I’d rather not have to take the positioning flight. The certainty makes me feel better, especially when traveling with parents. Also, remember AA allows 5 day award holds. However, be almost certain you want to book the trip because there’s no guarantee that you’ll be able to see any award availability if you don’t follow through on the award hold. Stephen, wow, thanks again for the very insightful tips! I especially like how you would book a flight outside of your home airport with a position flight if necessary just to fly/experience a certain flight! Much appreciated once again! Hey! Thanks for this amazing review! Is it possible to book new Emirates first class suite on 777-300ER with mileage programs or only with cash? Thanks for reading! Unfortunately, you can’t currently book the new Emirates First Class Suite with points and miles. The best way is to search for some cheaper cash fares, such as Colombo (CMB) – Dubai (DXB) – Brussels (BRU). Thanks again! Thank you for this blog post. How does KE Kosmo Suites 2.0 experience stack up to the other Asian carriers? I’m flying IAD-ICN next month and am super pumped. The hard product seems pretty great, though not as flashy as the middle eastern carriers, like you stated. Congratulations! Your experience will be very private and spacious. The hard product is excellent and you will not be disappointed at all. The soft product is great as well, but the lounge and ground experience is lacking. However, the in-flight experience is more important! Have fun on your trip.